A: I am from Ontario, Canada. I basically grew up in Toronto. Q: How did you make it to New Smyrna? A: I finished a start up on a fitness club in Toronto and was looking for the next stage with another company. I had always been interested in moving to the states because my brother and my dad had lived here for many years. I contacted a consulting company in Chicago, worked out a deal and they transferred me down to Orlando. Soon after I was offered a position with Morgan Stanley. I moved to NSB in 1998 after visiting my brother in Deland for a 2 week vacation. I came to New Smyrna, cruised around, did some surfing and thought what a great place. Q: Tell me how you started Outdoor Robotics. A: Outdoor Robotics is a brand of Grimmster Technologies which we setup to innovate, design and develop Modular Drone and Unmanned Aerial Systems (UAS) Technology for personal and commercial use. Since Grimmster already did product design and online technology development for other companies since 1998 we had been interested for sometime in launching a new venture that we could grow. We all like to design and build cool stuff, especially if it has a creative and purposeful value. 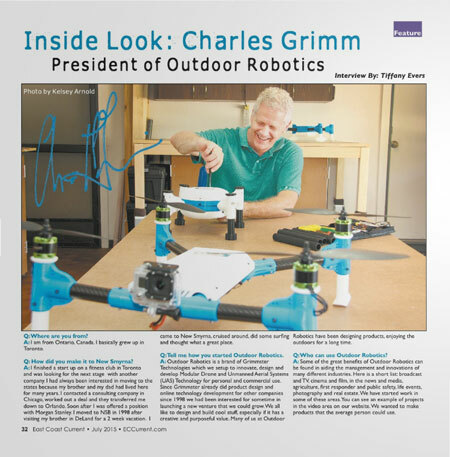 Many of us at Outdoor Robotics have been designing products, enjoying the outdoors for a long time. Q: Who can use Outdoor Robotics? A: Some of the great benefits of Outdoor Robotics can be found in aiding the management and innovations of many different industries. Here is a short list: broadcast and TV, cinema and film, in the news and media, agriculture, first responder and public safety, life events, photography and real estate. We have started work in some of these areas. You can see an example of projects in the video area on our website. We wanted to make products that the average person could use. Q: What are the legal issues surrounding drones? A: The Federal Aviation Administration (FAA) is trying to develop rules for flying. Right now there is a very general rule that states radio control (RC) people can fly these RC planes up to 400 feet. When you go above that you are looking at different licenses. So we are all operating under radio control licenses right now. This is all changing gradually as the FAA is better able to understand all the implications of this technology and starts putting in place new rules. If it is yours and you are flying it for recreation you wont have a problem. But check the FAA website for details. Q: What is the difference between drones and your MODs? A: The Modular Component System or MOD was designed to make it easier and more versatile for any person no matter your skill level to be comfortable assembling, flying or customizing. We use a proven open source autopilot system that makes it easy for just about anyone to pick up and start using MOD quickly. We continually designing more airframes and add-on components and soon we will begin making it easy for you to design and 3D print your own parts to make the MOD even more custom. The MOD disassembles quickly and simply for easy transport. There are 4 main airframes that range from 13, 15 and 17-inch models. We have the ability to attach multiple cameras to our designs and offer interchangeable landing gear. You can add tall landing gear for adding cameras below, add shorter landing gear for stabilized takeoffs and landings, add flat skid plates, landing hooks for transporting items and more. If someone has a landing gear idea, let us know and maybe we will design it. Q: What camera attachments do you have? A: Right now we designed brackets that work with GoPro’s. They are a great brand and a widely used high quality product. But we are in the process of designing brackets for other action cameras. Q: What step is your company in right now? A: We are in an investor stage. Meaning, for us to manufacture and get them out for purchase we need a growth partner to fine tune the product and start manufacturing. We have been in the developing and testing stage for almost 3 years. But now we have people and companies that want purchase, so we have to get rolling. Q: Do you have an idea of your price range? A: We are looking at right under $1,000. Q: How many models have you designed? A: We have four core body (air frame) designs. But we have many different customizable options and add-ons so consumers can create a MOD to fit their needs. Q: How high can they go? A: Legally, you can go up to 400 feet. J But they can go higher. But you have to have pretty good eyesight or be using First Person View Technology. Q: Will your MODs have a GPS in it? A: Ready to Fly MODs, will have GPS. Electronics is not included with Air Frame kits. Most MuitiRotor Drones, which is the classification we are in, has a feature called, “Return to Home.” So if it starts getting out of control or the weather changes you can activate that safety feature and it will basically turn around and come right back to where it was launched from. Q: How long do you think it will be until the FAA passes a law allowing these to be used for a service? A: I really don’t know. The FAA rule changes are almost weekly. A lot of people especially businesses are waiting for these answers. Some commercial licenses are being given out now. From what I have heard recently, it is going to be about a year or more until they announce more specific rules and regulations. Best to check the FAA website for up to date information. Another great resource is the Association for Unmanned Vehicles Systems International.